I have blogged before about articles written by Atul Gawande, a surgeon and faculty member at the Harvard Medical School. He is an original thinker who always offers a slightly different perspective on important issues. Many things have been written about health care since the Supreme Court’s ruling on President Obama’s plan. Gawande’s recent blog post on The New Yorker’s website discusses the implications of health care reform in the context of addressing so-called “wicked problems.” Not only does he offer helpful insights into the health care debate, but those insights apply to other wicked problems facing North Carolina and the country. Gawande describes how the “rhetoric of intransigence,” which has been used throughout history to oppose basic social change, is being used to oppose health care reform. In other words, it is easy to point out the problems associated with any proposed solution to a wicked problem. Health reform is no different. 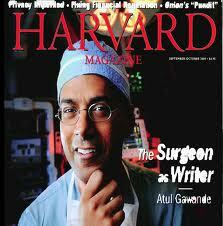 Regardless of your politics or your position on health care reform, Gawande brings his usual insight to this issue. As we extend the School’s work on public policy, his analytical framework is helpful in anticipating and understanding some of the challenges we will face.